I loved Y4. I taught that year group more than any other through my nineteen years at three London schools and two in Herts, and they were mostly, in a three tier system, the top class or leavers – which earned them special privileges including a residential trip away. They probably ‘grew up’ faster that way, and showed that they could, with a few exceptions, take responsibility with enthusiasm. Ian was foreman in charge of young gardeners when the Wild Garden was born; Alec was my technician, troubleshooting with I.T. problems. Every summer, being an emotional softie, I truly hated to see them go, and some of the tears shed in my classroom were usually mine. During their year with me they experienced stories by immersion, and books led into art, drama, dance and music as well as P.S.H.E. In questionnaires sent round by the head, my Y4 classes put Poetry at the top of their favourite subjects chart. What did I learn about children as they turn from eight to nine? How imaginative they are. They no longer actually believe in a little dragon I pass from hand to hand even though there’s nothing there, but they will suspend disbelief for the fun of it. I initiated a game on playground duty which involved a group searching for mini aliens, bringing them cupped in their hands and describing them in excited detail. Their imagination has a wild, free, elastic energy that embraces creativity. They enjoy discovery, and that includes new words they can’t wait to use. Enthusiasm in Y4 can be boundless if not obsessive, but they don’t fake it. However well behaved they were, I could always tell when they were less engaged than I liked them to be. If a Story Time book didn’t compel them into still, wide-eyed silence then it wasn’t good enough. The best had them leaving at 3:15 reluctant to wait another twenty-four hours, talking animatedly about what might happen next. A great story meant faster clearing up to make it onto the carpet for the next instalment. Clearing up doesn’t seem to be an obvious Y4 strength, but walking briskly back from the swimming pool (to allow their poor teacher enough time for a coffee before break ended) seemed, year on year, an objective that would never be achieved. Y4 children don’t progress beyond dawdling. On the subject of swimming lessons, boys and girls don’t sit together by the poolside. Exceptions really were rare. I do remember, however, a boy adored by all the girls and kissed by many of them at the Leavers’ Disco. It takes a confident Y4 girl to volunteer to partner a boy for any activity, but a very few are kind enough to cooperate with, and nurture, the boy with the most obvious and challenging behaviour issues. Girls’ friendships are paramount in their lives and fall-outs are melodramas, sometimes involving the mums concerned, because in Y4 parents are still very protective. Many girls sustain a tight bond with a best friend for the year and beyond. Boys rarely commit so exclusively but I recall a few exceptions. It could be distressing unfolding papers that named the four classmates they would most like to room with on the residential trip, to find some names recurring again and again, but just occasionally, one name not listed at all. For some, room allocation was an issue of cataclysmic importance, while others blithely offered to swap to assuage grief. As humans Y4 members can be capable of cruelty and some lie readily, even in the face of the evidence. Maybe that imagination I celebrated facilitates the shaping of an alternative reality! In Y4 most children find being ‘in trouble’, or feeling guilty, difficult to manage. Most form an attachment to the class teacher with whom they spend most of each day, and ‘love letters’ have not yet been outgrown, although they are almost exclusively female in origin! Some boys in Y4 can be sensitive, soft-hearted and sorry to leave their mums for that school trip. Football is the default playground activity but it’s not yet obligatory and difference will often be tolerated. The biggest surprise for anyone not accustomed to Y4 classes would probably be their depth. I wish I’d written down the intuitive, reflective, empathic and wise things they said, not just in R.E. or P.S.H.E but when discussing characters in stories: their feelings, needs and motives. Yes, this is an age when children love to laugh, but their emotional intelligence is often striking. Hence the power of Michael Morpurgo’s novels in a Y4 classroom, where the mood created could be palpable and exhilarating. That’s what inspired me to be become an author myself. Of course, any Y4 class is a heady mix of individuals and I’ve been extracting contentious generalisations from a distance, having left teaching ten years ago to write full-time. 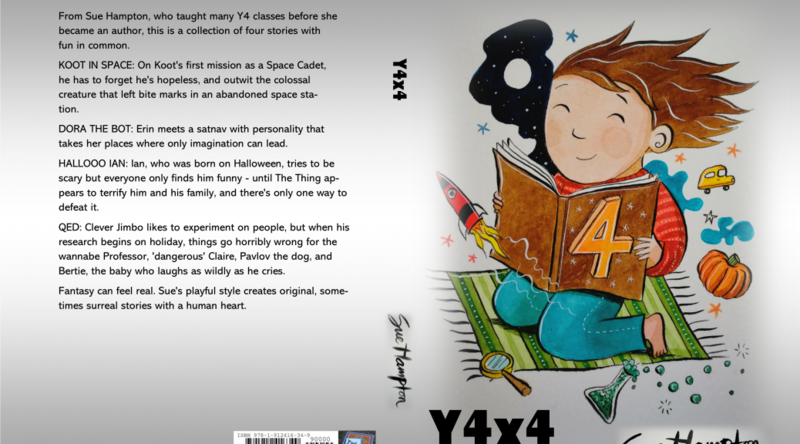 If I was ever going to produce a collection of short(ish) stories for any age, it was bound to be Y4. In my head the title is Y4 ‘by’ 4, because I’m a lifelong fan of the longer relay, the one where the athletes are less likely to drop the baton. The stories are a kind of team and they do connect thematically. I always create strongly independent and unconventional girls – the sort I found stimulating to teach – and this book is no exception, but I could say that it was written with boys in mind. Humour is a major factor, the imaginative content almost surreal in its wildness at times. I bore in mind their delight in playful language and inventive imagery (which they invent themselves with freedom and relish) but also the way they connect with underlying emotional themes. Strip away the boisterousness of the fantasy and these stories are about self-esteem, fear, diversity and taking care of each other. There’s a lot of love lurking! I’d like to think that some of my pupils might read them to their Y4 children. Loved this, Sue! Have forwarded to my niece who is shortly to finish her N QT year as a Yr 5 teacher!